Just this week, more than 500 CWA Shop Stewards from across New Jersey gathered in East Brunswick to discuss how we win this campaign. What we know is that it will take a lot of hard work, one-on-one conversations, door-knocking, phone banking and a plan to fund these efforts. To win, we will need to take our message to New Jersey voters – even as powerful special interests try to convince voters otherwise. That’s why CWA is holding an important vote to temporarily increase dues by 50 cents per week to pay for the campaign that’s needed to ensure the ballot initiative passes. The campaign will include paid media, mailers, and a massive Get-Out-the-Vote effort. If you believe that you’ve earned your pension and deserve retirement security for the incredible work you do to keep New Jersey running and you’re ready to join this fight, then vote YES for the temporary dues increase! Polls are now open and will remain open until 5:00 pm on Friday, March 4th. 1. To vote by phone: Call 1-800-514-2629 toll free within the US, Canada, and Puerto Rico. Outside these toll free areas call 1-503-419-1100. 2. To vote by Internet: Go to https://BallotPoint.com/CwaDistrict1. The ID and PIN will be sent to you, but for almost all members, the ID is the last six digits of your Social Security Number followed by your zip code. If you have any questions or problems casting your vote, please contact your Shop Steward or your Staff Representative. Securing funding for our pensions is the greatest challenge we’ve ever faced. 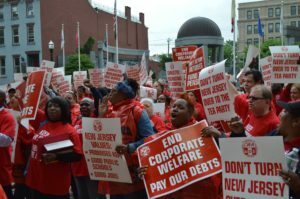 It is critical that CWA members and public workers across New Jersey stand together in solidarity to fund this campaign and mobilize to make sure this constitutional amendment passes in November!